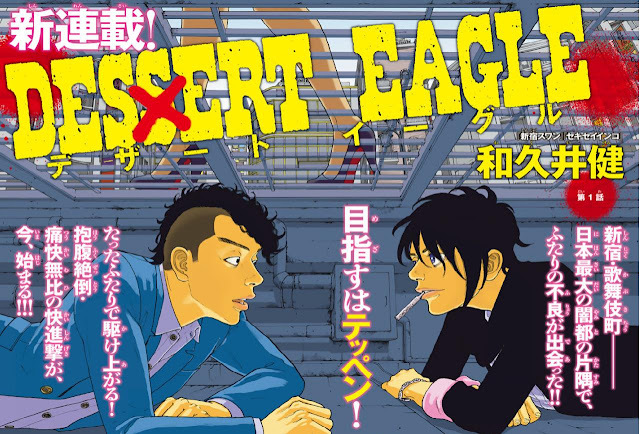 Desert Eagle began in double issue 36/37 of Weekly Shonen Magazine by Ken Wakui. Wakui is an experienced Seinen mangaka with threes series to his name. Shinjuku Swan was his most successful series; his subsequent works have not been as great. Desert Eagle is Wakui's first work in the Shonen genre, so he might bring a different atmosphere to this series that others in the same category. The story revolves around two seemingly ordinary delinquents who in their spare time pick fights with criminal groups to help strangers. Wakui's artwork is very usual and it will surely have fans and haters. The plot is more or less about two bored guys, one with intellect and the other with brawn, that have nothing better to do than to be vigilantes.